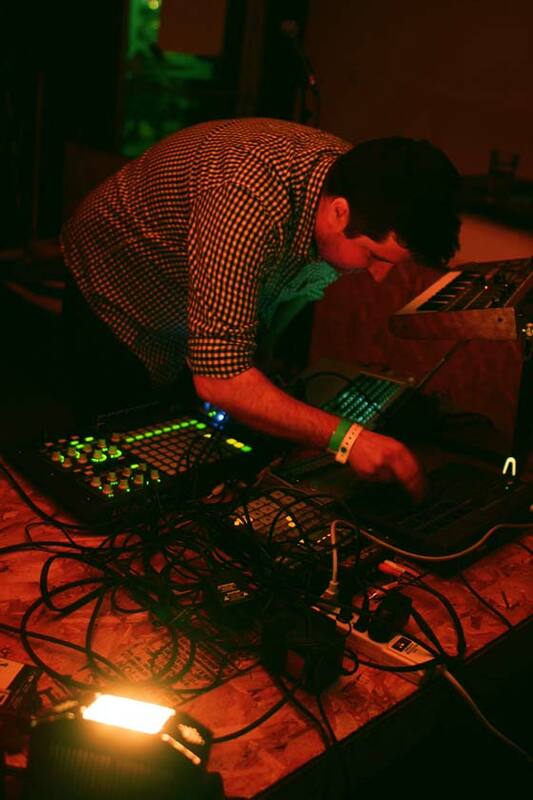 Despite uploading their first track to Bandcamp in April of 2013, Panamax is still a relatively new project for Tim Hoover (electronics, programming) and Curran Faris (guitar, technology). With Hoover busy as DJ Co-op and his involvement in Union Sound Hall and the Good Will Social Club, coupled with Faris' commitment to post-punk act Warsaw, Panamax are still establishing their sound and experimenting with the collaboration. Performing to a packed crowd in the front side of the Handsome Daughter, Faris' post-rock guitar leanings remind you of Tortoise's early work, before they became obsessed with jazz, while Hoover's carefully programmed drums, understated synth textures and restrained approach gave the duo plenty of rhythms to work from. Showcasing tracks so new they didn't even have working titles, Panamax's subtle guitar textures, skipping percussion and slow building momentum seemed perfectly suited for the early evening time slot. The duo's final cut may have been the most fully realized idea of the night, with Hoover's driving 4/4 beat, crisp hi-hats and care-free hand claps providing the foundation for Faris' repetitive dance-rock guitar riffs to zero in on the groove. Let's hope there is more where that came from the next time they perform.